Aberdeen Airport has been named the industry’s most improved by the Airports Council International (ACI). The title goes to the airport that has managed the biggest improvement in overall customer satisfaction. The quality survey was based on data from 200,000 questionnaires which were completed by passengers in 2007. The world’s first commercial aircraft to be powered partly by biofuel took off from Heathrow on Monday. The Virgin Atlantic 747 flew from London to Amsterdam using a 20% biofuel mix of coconut and babassu oil in on of its four fuel tanks. Sir Richard Branson said the flight was the first step towards using biofuels on commercial flights. However, climate change experts have criticised the flight as a publicity stunt. Kenneth Richter, Friends of the Earth aviation campaigner, said: "Biofuels are a major distraction in the fight against climate change. British Airways passengers could face severe disruption at Easter unless talks to avert strike action by pilots are successful. BA and the British Airline Pilots Association have agreed to take their dispute to a mediator after 3,000 BA pilots voted for strike action. The action could take place anytime over the next 28 days as long as pilots give at least seven days notice. If strike actions were to go ahead it could affect 100,000 BA passengers a day. PC2Paper are proud to present our latest offering, the PC2Paper Printer. 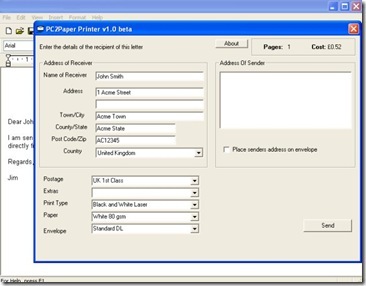 It quite simply makes sending letters from your PC as easy as printing to your desktop printer. We have released the printer as a beta to allow customers to test the service and offer their feedback. 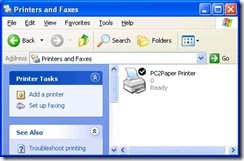 Once installed the PC2Paper Printer will appear on your PC as a normal printer. If you want to send a real letter from the Internet, you can do so directly from your desktop PC. 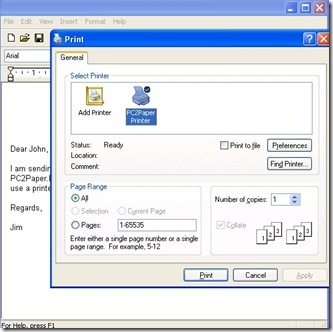 Open up your favourite word processing program, type a letter and select print to send your letter. 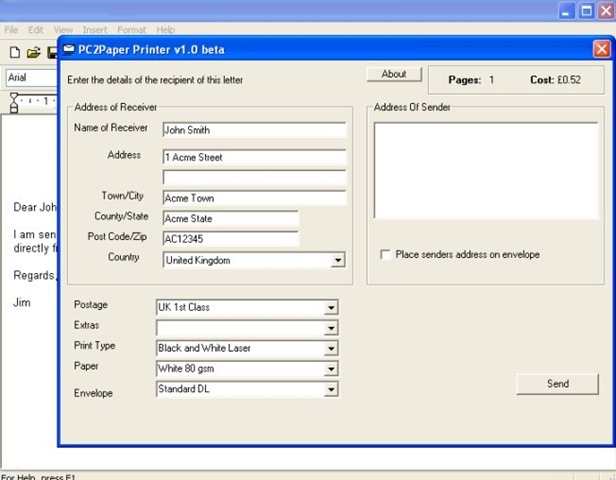 Selecting print will bring up the following dialogue box that will enable you to enter the receivers address and select your postage options. National Air Traffic Services (Nats) plans to change flights paths in and out of major UK airports to try and reduce the impact on urban regions. The proposals aim to reduce by 20% the number of people that are affected by departing aircraft flying below 4,000ft. The plans will mean a reduction in the number of flights. It will also mean that some rural areas will experience higher noise levels. Several towns including Southend, Sudbury, Hitchin, Hatfield, Princes Risborough and Royston that currently have high levels of noise should see a reduction. The plans will affect Heathrow, Stansted, Luton and London City and are the first overhaul of routes for several decades. The new routes will be brought in around spring 2009. This weeks travel blog of the week is Honeymoon Around the World written by Steve and Christy. It follows their progress as they take time out from their jobs for an extended honeymoon travelling around the world. Their journey starts in June 2007 with their wedding in Mexico and then heads to Iceland, Europe including Ireland, England and Italy and then onto Africa before heading to Thailand, Cambodia, Laos and eventually New Zealand. There is a lot of interesting content on this blog but for me a few posts stood out. The first from their time in Thailand is about the interesting food available at the street markets. One vendor was selling an interesting mix of fried bugs including meal worms, grasshoppers, crickets and cockroaches. Steve and Christy were brave enough to sample the fried grasshopper (pictured left) with Steve describing it as a "a fried mass of legs of body". Another post also on the subject of unusual food highlights the options available at a local market in Laos. Here, Steve finds an appetising selection of fried rats and fried bats. Although Steve was not planning on purchasing anything a fellow tourist offered him a bat. Apparently you do not need to add sauce to enjoy a fried bat (pictured right), you simply eat it as it is. The verdict was that it tasted like chicken. Despite trying the bat Steve stayed away from the other delicacies preferring not to sample the fried rat or surprisingly the coagulated cow blood. I can't imagine why it all sounds very tasty. Travellers at Heathrow were affected by a complete break down of Terminal 4’s baggage handling system on Wednesday. Economy class passengers who arrived at the terminal were told they could only take hand baggage with them meaning they either had to leave their luggage behind of miss their flights. Around 4,000 passengers were affected by the problem, with most of them decided to switch airlines or postpone their trip rather than leave their luggage behind. The problem was caused by the automatic baggage sorting system breaking down because of a software failure. It is now the 10th time the baggage handling system has broken down since last May. An engine fault has been ruled out as the cause of the Heathrow crash a few weeks ago. The investigation also found that the engines had not been hit by a bird or a piece of ice. The news means that the investigators are still no closer to solving the mystery of why the plane came down short of the runway. There were also no signs of fuel contamination, however there were pieces of debris found in the fuel as well as unusual air bubbles in the high pressure fuel pumps. These findings are still being considered. BA and Virgin will have to pay out refunds to customers who flew long haul between 11 August 2004 and 23 March 2006 after they were found to be fixing prices. BA was fined for price fixing on fuel charges. Virgin also admitted to breaching the law but escaped a fine. The two companies will have to refund one third of the fuel surcharge which would work out to between £2 and £10 per flight. Satnav devices have been blamed for directing articulated lorries down small country lanes which then leads to damage to bridges. The problem was highlighted after rail chiefs found three of the most hit rail bridges were within a one mile radius in the same town. The three bridges in Grantham in Lincolnshire have been struck 62 times between them in the last year. The number of collisions nationally has also risen from 885 10 years ago to 1,340 today. A spokesman said: "It's a rising problem and satnavs are playing a greater role. They are great tools but they are no substitute for common sense and following the rules of the road." The problem is put down to the fact that when people are using a satnav device they rely on it blindly and do not question whether a bridge is high enough. Apparently drivers are no longer able to read the danger low bridge signs. Monmouthshire council leaders have backed a campaign to stop six post offices closing. The council cabinet says that six post offices that have been earmarked for closures are essential in the county and that they provide vital services especially for the elderly. The threatened Post Offices includes outlets in Govilon, Llanellen, Mathern, Sudbrook, Tintern and Devauden. A new system of luggage tracking has gone on trial at Heathrow. The system used radio frequency identification to tag baggage. The trial project will involve Emirates and will track around 50,000 bags each month over a six month period. It will allow staff to track bags at each stage of the process so that they know exactly where the items are and should help to cut down on lost items. Passengers that give their mobile number will also be able to receive a text message to let them know the location of their bag when they land. Pakistan and India have agreed to double passenger flights between the countries. They will also expand the number of destinations which are served by the flights and allow more airlines to operate on the routes. There are currently 12 flights a week which link Delhi and Mumbai in India with Lahore and Karachi in Pakistan with only Indian Airlines and Pakistan International Airway operating on the routes. The new deal will mean that both countries will be able to operate up to three airlines on each route. The number of routes will also increase to include the Pakistani capital of Islamabad and the southern Indian city of Madras. This weeks travel blog of the week is China Travel. The blog covers the travels of Tom Carter who has spent 2 years backpacking in China. Focusing more on the the things you probably wouldn't see if you went on a packaged holiday. One of the most amusing articles on the blog is titled Chinese Youth Hostels. As a veteran backpacker, hostels are essential for Tom. He quite comically recalls an extended stay in a laid back hostel in Chengdu over 7 days. Encountering several Australians, Europeans and Americans who had also got pulled into the laid back life style of the hostel. Tom likens the hostel environment to that of a Reality TV Series 'Backpackers Behaving Badly', his stay is filled with occurrences of dorm mates arriving back drunk passing out in the early hours of the morning after going out partying each night. A study has found that people living in the noisiest places around airports are more likely to develop high blood pressure. The study was carried out on 600 people who live under the Heathrow flight path. It also found that noise from flights causes immediate increases in blood pressure in sleeping people. Campaigners say that the results of the study support the argument for a ban on night flights at UK airports. The EU Justice Commissioner Franco Frattini has said that visitors to the EU could face biometric border checks. He says that visitors from outside the EU could face a biometric check as part of their visa whilst those not needed a permit will be checked when they arrive. Under the system travellers from within the EU would face only random checks. He also has plans to improve border surveillance. If the new measures are approved by all EU member states they would be introduced between 2010 and 2015. Plans to redevelop Carlisle Airport have sparked protests from climate change protesters. Stobart Air Limited wants to invest £25 million in a rebranded Carlisle Lake District Airport that will increase freight and passenger flights. The plans include the construction of a new runway, passenger terminal, air traffic control centre, hangars, office building, warehouses and car parking facilities. The current runway was built in the 1940s and can only handle a limited amount of traffic. Campaigners are unhappy about the plans attracting large passenger aircraft which they say would pose a threat to the environment. A passenger jet was struck by lightening last weekend and as a result had to abandon its flight from New York to London. It happened on Saturday night after the planes took off from Newark Liberty International Airport. Passengers heard a loud bang which was followed by a flash of white light. The plane returned to the airport and landed safely. Passengers were later switched to another aircraft because the strike had left a gash in the planes nosecone. Thomas Cook have acquired a hotel booking website. Hotels4U who are based in Egham in Surrey was set up in 2003. The website supplies accommodation to the British travel industry and acts as an online booking agent. Thomas Cook have paid £21.8 million for the company. The first steam engine to be built in 50 years to run on the UK mainline will be ready for testing in April. The train called the Tornado has been built in Darlington by hundreds of volunteers from around the UK. It has cost £3 million and has taken 18 years. The train is based on the Peppercorn A1 locomotive which was withdrawn by British Railways in the 1960’s. The train will be used for charter journeys when it is completed. A passenger who was on board the plane that recently crashed landed at Heathrow will sue British Airways. Paul Strafford is taking legal action because he suffered trauma as a result of the emergency landing. He says that since the incident he has been highly anxious and unable to sleep. Personal injury lawyers have said passengers who had been traumatised by their experience could claim up to £85,000 on a "no-fault basis". Ryanair has been ordered to pay £5,000 to a group of men they wrongly identified as terrorists. The group of black musicians were on their way to London from a festival in Sardinia when a fellow passenger thought their behaviour was suspicious. The passenger saw the men laughing and joking in the departure lounge but became suspicious when he saw them sitting separately on the plane. Two families had refused to fly if the men remained on the plane, promoting the Captain to remove them. The men were removed by armed police carrying guns. Despite the fact they were then given the all clear at security the Captain would not let the men back on the plane because the other passengers were anxious. The group of men were stranded in Sardinia overnight as a result of the incident and missed spending New Year’s Eve with their families. This weeks travel blog of the week is Riding the Spine. The blog charts the progress of Jacob, Goat and Sean and their three year trip cycling the Continental Divide. They began their trip in July 2006 and are currently in Nicaragua. One of my favourite articles charts an incident where Sean has a run in with the local police. Whilst looking for a place to camp for the night, he had ended up on private property and venturing out for some groceries Sean came across the landlord who called the police. Three policeman quickly arrived armed with automatic rifles and after searching him they proceeded to ask lots of questions. Sean tried to make the Spanish speaking officer understand that he gone out to get some groceries but feared the worse when they ordered him into the police car. The police then proceeded to drive him to the grocery store before helping him pick out the groceries and even feeling each piece of fruit to check for ripeness. They then drove him back to the campsite. Another article from their time in Mexico highlights the abundance of scorpions. Jacob describes finding scorpions under his mattress every night before being stung by one. He was left with a painful and numb arm and still had a numb finger several days later. These are just a few articles from this blog but there is a wealth of interesting stories here. Airbus has said that it expects passenger traffic to grow at an average of 4.9% a year. This would mean a trebling of global passenger traffic over the next twenty years. The company forecasts that 24,300 passenger and freight aircraft will be ordered between now and 2026 and expects demand to be greatest in Asia Pacific. Union leaders have announced that workers will be balloted on strike action. The Transport Salaried Staffs Association said its members will vote from 15 February to 11 March. The Rail Maritime and Transport Union has not yet set a date when its workers will vote. BA has become the latest sponsor of the 2012 Olympics paying around £40 million for marketing rights. They will also fly British athletes to this years Beijing Olympics and the 2010 Winter Games in Vancouver. Other major sponsors of the Olympics include Lloyds TSB, EDF and Adidas. Manchester Airport has closed one its runways to allow maintenance work to be carried out. The airports usual traffic will use the remaining runway whilst the work is carried out. There are not expected to be any delays to flights from the airport. The second runway will reopen on 29th February. It is likely that tube workers will stage a series of strikes. The two main unions have given London Underground 48 hours to agree to a list of nine demands. If they do not aggress staff will be balloted today. The demands cover a number of issues and it is unlikely that an agreement will be met. One of the issues includes a ban on agency workers and sub contractor working on underground lines. If they go ahead the strikes will take place next month. A new high speed train has been launched in France. The train which is called the AGV will replace the TGV. The new trains will travel at a top speed of 224mph compared to 186mph, the top speed of the TGV. This would mean that the journey on Eurostar from London to Paris would now take only 1h42 minutes compared to the current 2h15 minute journey. Eurostar whilst interested in the new train have no plans to replace its current fleet of trains for the next ten years, so those who are looking forward to getting to France in less than two hours will have a to wait quite some time. Ryanair have said that profits could fall by around 50% next year. The warning has come as a result of higher oil prices combined with poor consumer demand and the weaker pound. Shares in the company fell by more than 10% after the warning. Despite the warning Michael O’Leary the Ryanair boss said the company had managed a "creditable performance in very adverse market conditions", and said he still expects profits for the current year to be ahead by around 17.5% to €470m”. A group of suspected Islamist suicide bombers have been arrested at Gatwick airport. The six men, who were all from Pakistan were arrested 10 days ago and held under anti-terrorism laws. They had flown in from Barcelona and were arrested after a tip off from the Spanish intelligence services after the discovery of a suspected Al-Qaeda cell in the city. The six men were questioned before being held over night and then being escorted onto a flight back to Pakistan. PC2Paper now offer US certified mail from our US printing station. 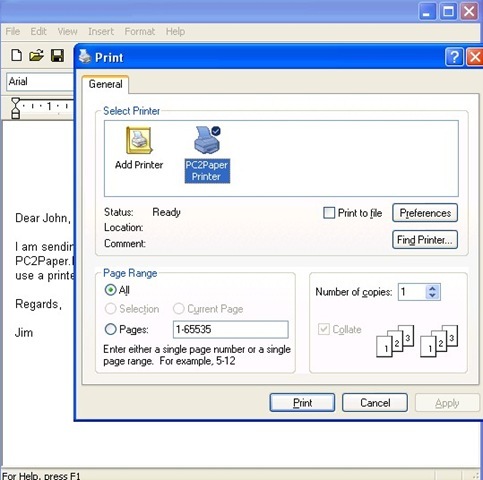 To use this service when sending a letter to the US, select the US printing station and then the option for certified mail. When you send your mail certified we will email you a tracking id you can use to track the whereabouts of your letters from the US Postal services web site. If you have any any more suggestions on services you would like to see from us, please do not hesitate to get in touch, we'd love to hear from you. This weeks travel blog of the week is Nate and Shelly's RTW Trip, a married couples blog of their travelling experiences around the world. The blog covers Nate and Shelly's travels to Argentina, France, Guyana, Italy, Peru and Uruguay and is filled with interesting stories and photo's of their travels. One article I found interesting was their trip to Buenos Aires, Argentina where they visited Recoleta Cemetery which is also the resting place of Eva Peron. I found Nate's 3 points on "what we throw away" in Argentina quite amusing. He says that garbage is collected every day in the city and can be quite a dangerous excise as bin men run down the street next to the truck throwing rubbish into the truck narrowly avoiding pedestrians. Recycling appears to be done by enterprising locals sifting through the rubbish you put out before the bin men collect it. Avoiding dog mess is another issue when walking through the streets as it is never cleared up and requires one eye constantly focused on the ground. British Airways are likely to deliver record profits this year, in the first nine months of the financial year they have reported a 35% rise in earnings. This is despite rising fuel costs and a fall in economy class bookings during January. BA has recently announced a business class only service that will fly from London’s city airport to New York. They have also not ruled out making a take over bid for BMI which would give them control of 50% of Heathrow’s slots.